You are here: Home 2015 October How to Deploy the ASA 5508-X or ASA 5516-X in Your Network? We talked about the new models of Cisco ASA with FirePOWER services: the ASA 5508-X and 5516-X. Yes, with the cool ASA 5508-X or 5516-X, you can set a better network. 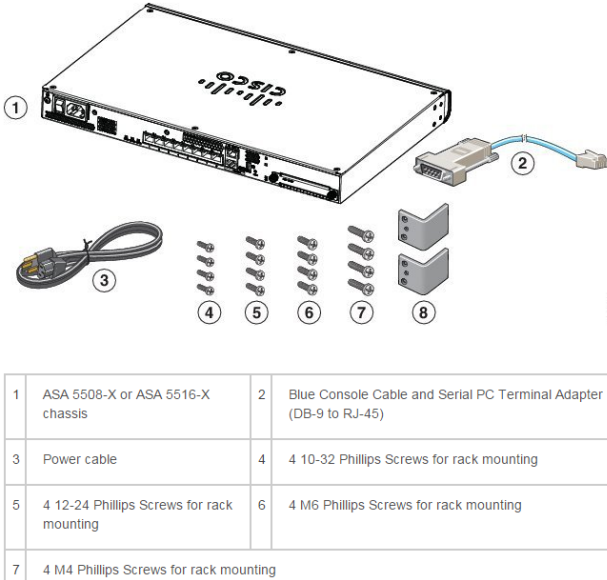 So how to deploy the ASA 5508-X or ASA 5516-X in your network? We will tell you in this article. Firstly, let’s have a look at the package contents of the chassis. Note: The contents are subject to change, and your exact contents might contain additional or fewer items. Note: You must use a separate inside switch in your deployment. The default configuration enables the above network deployment with the following behavior. ■ Management 1/1 belongs to the ASA Firepower module. The interface is Up, but otherwise unconfigured on the ASA. The ASA Firepower module can then use this interface to access the ASA inside network and use the inside interface as the gateway to the Internet. Note: Do not configure an IP address for this interface in the ASA configuration. Only configure an IP address in the Firepower configuration. You should consider this interface as completely separate from the ASA in terms of routing. Note: If you want to deploy a separate router on the inside network, then you can route between management and inside. In this case, you can manage both the ASA and ASA FirePOWER module on Management 1/1 with the appropriate configuration changes. Note: You can connect inside and management on the same network because the management interface acts like a separate device that belongs only to the ASA Firepower module. 2. 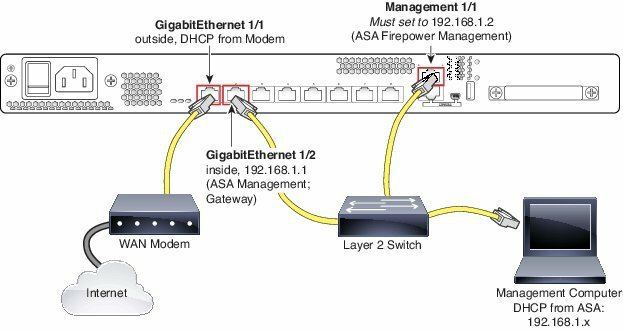 Connect the GigabitEthernet 1/1 (outside) interface to your WAN device, for example, your cable modem. Note: If the cable modem supplies an outside IP address that is on 192.168.1.0/24, then you must change the ASA configuration to use a different IP address.